Narcissus ‘Toto’ (Miniature Daffodil) Entry Garden; This miniature narcissus has white petals with a straight cup opening yellow, then fading to creamy white. Narcissus ‘Rijnveld’s Early Sensation’ (Trumpet Daffodil) Entry Garden; This classic yellow trumpet-type daffodil is one of the earliest blooming, tolerating snow & cold. Narcissus minor var. 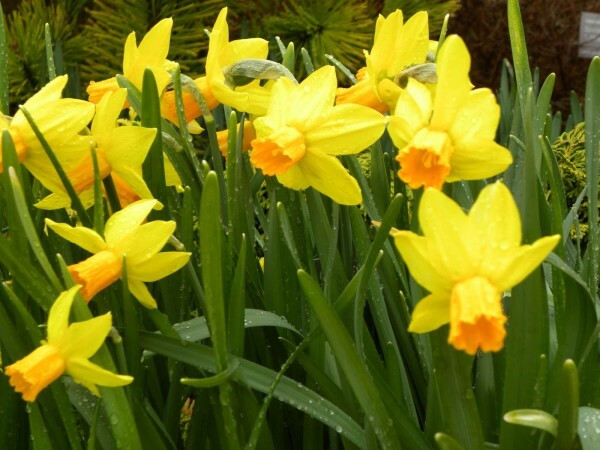 pumilus ‘Rip Van Winkle’ (Miniature Daffodil) Demo Garden; This Irish Victorian selection has been around since 1884 featuring double yellow flowers on 6″ stems. Narcissus ‘Tamar Fire’ (Double Daffodil) Demo Garden; A double-petaled selection with bright yellow petals highlighted by red-orange accents. Narcissus ‘Ice Follies’ (Daffodil) Demo Garden; This large-cupped selection has white petals and a yellow corona, reaching up to 18″ in spring.